check it out. Join our Executive Chef Jeff Woolley behind our kitchen doors for some hands on cooking experience. You will work side by side with Chef Jeff and create an amazing meal that you will enjoy at the end of your weekend. Our season has been planned so check out the dates and the topics. Your mouth will begin salivating. Consummate comfort. Memorable dining. Exemplary service. Come to the Manor on Golden Pond and experience luxury New Hampshire hotel services with the charm of a country bed & breakfast inn. Our New England luxury resort began as a love story at the turn of the 20th century when a wealthy Englishman captured the heart of a beautiful debutante. On Shepherd’s Hill, in the Lakes Region of New Hampshire, amid the tall sentinel pines, they built a magnificent country estate with sweeping vistas overlooking Squam Lake, of Golden Pond fame. Now, at the turn of another century, the elegance and comfort of this English manor has been artfully restored offering the perfect idyll for those seeking a respite, a romantic getaway, a beautiful Holderness, New Hampshire bed and breakfast. The Manor’s 13-acre property, with sweeping panoramic views of the foothills of the White Mountains, has been masterfully restored and is a proud member of Small Luxury Hotels of the World. 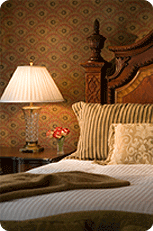 Beautifully appointed accommodations offer all the amenities of a luxury New England hotel while retaining the charm and tranquility of a New England country inn. Whatever your wish, we are always here to provide personalized service and attention to every detail. From the moment you reach the top of Shepherd’s Hill, we want your experience to be memorable, the stuff of dreams. For a brief time, this is your home to savor and enjoy. The Manor on Golden Pond awaits discerning visitors looking for a distinct destination resort with local character, refined décor, memorable cuisine, and world-class service. It is the destination with a difference at the end of the road less traveled, and it makes the journey well worthwhile.